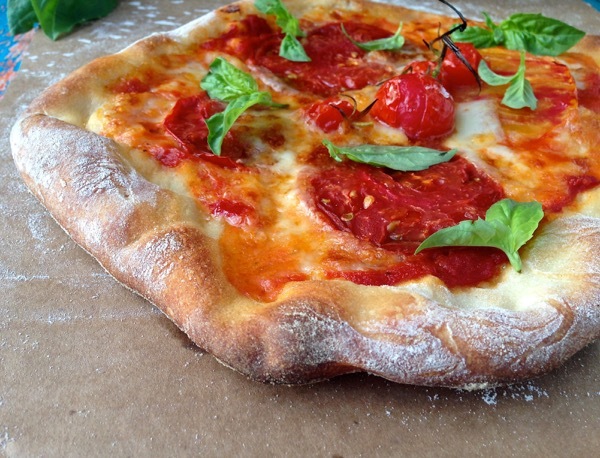 The best, easy, thin and crispy crust rustic Italian pizza dough recipe you will ever make. Step by step how to video included below. 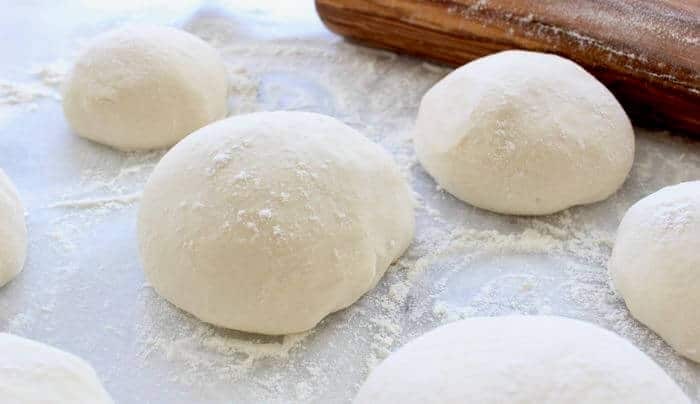 A quick, authentic, thin and crispy, Neopolitan style homemade Italian pizza dough recipe that is also perfect for freezing! With a name like Florentina you would probably be willing to bet that I live La Bella Vita Under The Tuscan Sun and I can toss a pizza like no-body’s business. The truth is I do live La Bella Vita but under the California Sun, and I can’t toss a pizza for the life of me. 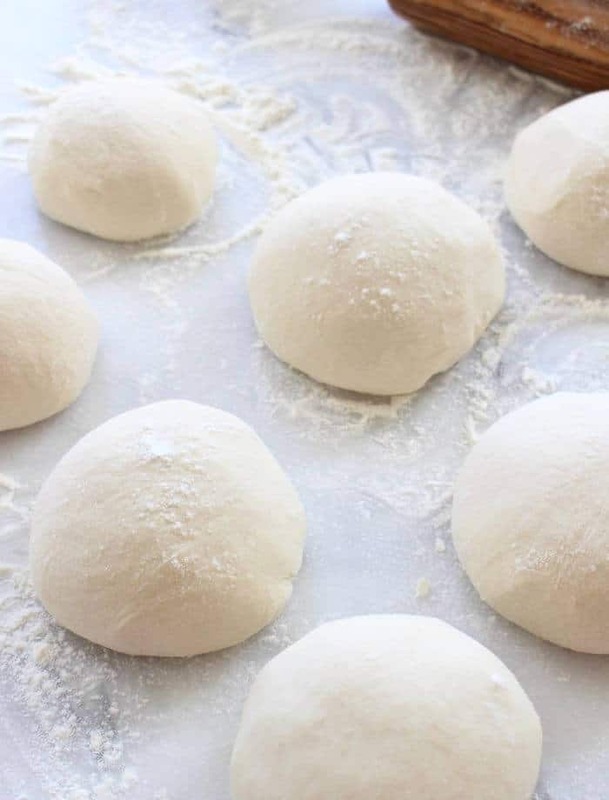 Tough you can make this Italian pizza dough recipe by hand, it is way easier to use a mixer. No tossing required! Honestly this is the reason why I got a Kitchen Aid mixer, and a pizza stone, (<–amazon links) so we can make the best homemade pizza ever. 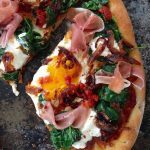 After constantly trying new recipes and formulas, and after having gone to Italy in the search of the perfect rustic authentic Italian pizza dough, I am even more confident that this is the best recipe out there. Quick and Easy to make by hand, food processor or Kitchen Aid Mixer! Make ahead and refrigerate for tomorrow, freeze for later or use right away. Vegan, perfect for strombolli, calzone, focaccia, bread sticks and even for the outdoor pizza oven. what is the best flour for pizza dough ? In my humble opinion an organic unbleached all purpose flour is ideal especially when making a thin Neopolitan crust. No fancy flour is required. what is a Neopolitan pizza crust ? An authentic Italian thin and crisp crust with charred edges and only a few toppings. heirloom tomatoes & fresh basil. The Secret to Italian Pizza Dough Perfection ? You must bake your rustic pizza on a Pizza Stone! Lightly brush it with some olive oil and as soon as the pie comes out of the oven top it with wedges of fresh tomatoes, basil, oregano and slices of fresh mozzarella di buffala. There’s no food on Earth like a homemade pizza, but even the best recipe will be lacking without the magic of a pizza stone. Even the most basic one gives you a close result to a wood burning pizza oven. Just remember to heat it up with your oven or it will crack. Give it plenty of time to warm up, even an hour or more if you aren’t in a rush. If you are looking for those authentic charred little fire kisses on your Italian pizza crust but your oven doesn’t go higher than 500″F, I strongly suggest finishing it under the broiler flames, just for the last minute or so. It will give you a similar effect as a wood burning pizza oven. Magical! 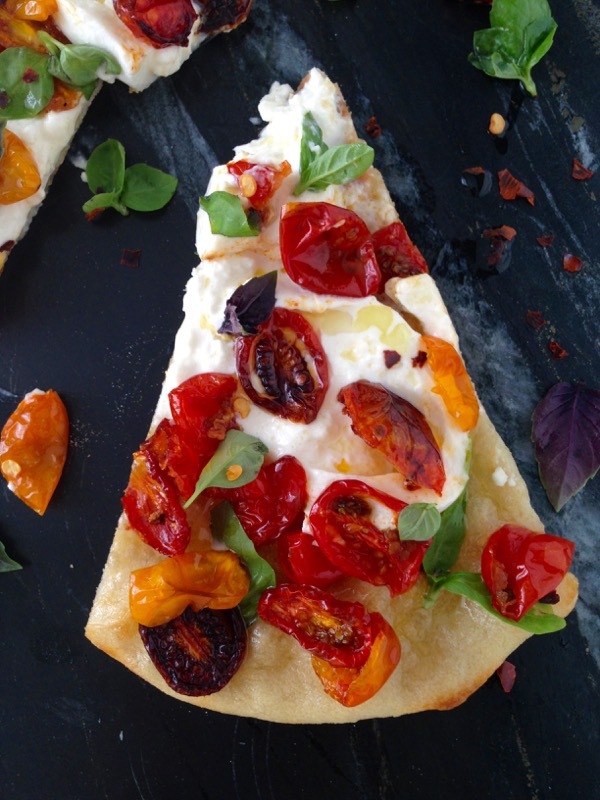 The absolute best, easy, thin and crispy rustic Italian pizza dough recipe you will ever make. Preheat your oven as high as it will go for at least 45 minutes to one hour. In the bowl of your kitchen aid and using the paddle attachment mix the flour, sea salt and active dry yeast (<--amazon) on low speed until all is incorporated then add the COLD water. Switch to the dough hook and mix together on low speed for 8 to 10 minutes. The dough should be smooth and sticky but should not stick to the sides of the bowl, only a little to the bottom. (If the dough sticks to the sides sprinkle in a little more flour, if it is too dry then add a bit more water). Sprinkle the counter with a little bit of flour, take one piece of dough and press down on it with your fingers until you have 1/2" thick circle or oval. Using your fists and knuckles start stretching the dough until 10" in diameter making sure not to tear it ( this should be easy since it is a small pie). Dust your pizza peel (or a piece of cardboard) very well with semolina flour or corn meal and set your pizza dough on it making sure it slides easily when moved. Pour 2-3 tablespoons of the pizza sauce in the center and spread it around with the back of a spoon leaving 1 inch of space at the edges and making sure not to get any on the peel. Sprinkle with the mozzarella and add your favorite toppings. ( Don't add too many toppings, keep in mind this is a thin crust and a couple of toppings will suffice ). Gently slide the pie on the preheated pizza stone in a hot 525 degree or more oven, and bake for 5 to 7 minutes or until golden brown on the edges. When making the breakfast pizza I find that the egg cooks perfectly in 6 minutes. Remove from the oven and sprinkle with the basil and freshly grated parmigiano reggianno. Allow to rest for a few minute for the cheese to set. Pour the flour into a large bowl. Add the yeast, salt and cold water and using a wooden spoon mix to combine well. Sprinkle some flour on a work surface/kitchen counter and dump the pizza dough. Sprinkle some more flour on top and using your hand knead the dough for about 10 to 15 minutes until a smooth ball forms but still a little bit sticky on the bottom. Follow the steps above afterwards. Make sure to preheat your oven with the pizza stone in it for at least 45 minutes, and finish cooking the pizza under the broiler for a nice charred touch. If topping with heirloom tomato slices, make sure to use the firm ones, otherwise the pizza would be watery. Thin firm slices is what you want. So love all your receipt’s ,,,,,send me to Italy now. Pizza Party at my house ! This pizza dough is the best I have ever tried..and it was super easy to make!!! It cooked up great on the pizza stone. It was so good we didn’t have any left over!! Hi Tina! I just posted this recipe in http://www.dinnerreviews.com ‘s Food For Thought and Recipe Section! Check it out! Thanks for allowing me to use your excellent recipes! I am sending lots of readers your way! Ciao Florentina! (‘ciao’ really goes hand-in-hand with your name…) Your friend Diana introduced me to your blog. She recommended the strawberry-spinach salad and here I am… browsing your blog, fascinated by your talent. I love the recipes and the way you talk about them. I’ve always thought a good recipe is even better, accompanied by an interesting story. I’ll definitely stop by more often. Nice meeting you! Thanks so much, nice to meet you as well! Woohoo! High temperatures and a pizza stone makes Pizza Magic! Love it! We have the Akron and I first tried pizzas in there and was lucky enough to have found this recipe for that first time…-& it’s the only one I use now! Love it!!!! I even add a piece of ironbark wood to the charcoal, what a flavour!!! I’ve gone thru one stone already, broke straight across lol such high temps in the Akron! Perfect for pizzas and this recipe! Although I have used a recipe close to this, this was one of the best pizza recipes I have made. I made one mistake, though. I let the entire dough rise for 1.5 hours before splitting it into 4 separate dough balls. I let them rise for 30 mins and then formed them into pizza crusts. I also used two pizza stones rather than one, one at the very bottom and another two racks down from the top. Put the pizza in at the bottom for about 4 mins. and then move it to the top for 3-4 mins. You will have a firm pizza bottom and chewy crust with a nice golden toasted cheese layer. Thank you for helping to refine my pizza baking. I do not use a convection oven but I would give it a try. It should cook the food more evenly at lower temperatures. When it comes to baking pizza you should still use high temperature and a pizza stone, unless of course you have a pizza oven 🙂 in which case high temperature is all you need. I used the convection oven with a pizza stone. I wish I could have a dedicated pizza oven, that would be nice. have you ever cooked a loaf of bread without a pan? That looks great! I used it for a BBQ pizza two weeks ago too ! Hi there! Great pizza advise. Haven’t tried it but was curious about the recipe which indicates cold water. I was always taught warm water and sugar to proof the yeast. Thanks for your help!! It used to be warm water and sugar to proof the yeast but with the dry instant yeast you can get at the store nowadays that really isn’ t necessary. I never had an issue and it’s much simpler. Go for it! It used to be warm water and sugar to proof the yeast but with the dry instant yeast you can get at the store nowadays that really isn’ t necessary. I also used two pizza stones rather than one, one at the very bottom and another two racks down from the top. It was so good we didn’t have any left over!! She recommended the strawberry-spinach salad and here I am… browsing your blog, fascinated by your talent. Thank you so much Gayle, I appreciate the love. Enjoy your time here, stop by often! I just made this with carmelized onions, feta, mozzarella and zucchini. It was killer. I didn’t have a pizza stone so I used a cookie sheet with parchment paper. It was perfect. Can u freeze the dough.? @Sandy Yes you can freeze the pizza dough. After forming it into balls just place them on a baking sheet lined with parchment paper and throw them in the freezer. Once frozen you can transfer them to individual plastic bags and use at your convenience. Do you let it rise or does it go straight into the freezer? What’s the best way to thaw it? Straight into the freezer, when ready to cook just place it at room temperature for 2-3 hours, it will proof while thawing out too. It works! The absolute best pizza dough I have ever had, I’ve only had a similar pizza in Italy . Sunday is pizza and movies day with the family. We are making this pizza dough again and again, perfect every time especially since we got a pizza stone. Killer ! I do not have a stand mixer. Can I knead it by hand and still get good results? Yes you may. I would suggest putting a little extra time into it , like 5 minutes or so. I’m wondering about the yeast and how it might not dissolve in the cold water. Was it dry active yeast or instant yeast? Hi Jodie, it is Active Dry Yeast, works perfect every single time. Enjoy ! What kind of specific yeast? Active Dry Yeast is all you need, I use the all natural gluten free packets available at the grocery store. My kids love making piza so I am excited to try yoour version with them. Oh yes, Pizza fun with the kids is such a blast ! Hahaha your opening line got me laughing out loud. Florentina’s Rustic Californian Pizza is just fine by me 🙂 I’ve always had that hook attachment that came with my stand mixer though we don’t own a pizza stone. We’ll definitely check out your suggestions…that pizza looks amazing! Thanks Jolina, hope you are having a great week! All of your pizzas look to die for and this recipe looks so easy! Sounds like this may need to be a part of our next date night in! Fresh pizza with homemade dough sounds amazing! Yum! I love making pizza at home, it’s such a money saver, it’s easier than a lot of people think! Florentina, this pizza looks absolutely positively divine! My Italian Grandma would have swooned! Ha ! I bet I would have loved your grandma, she sounds awesome ! No way, not in NY i can’t believe it ! Now we are really gonna have to make all our thin crust pizza at home. kitchen aid has made making pizza sooo easy for me too. this looks great! Homemade pizza is the best!! We love doing it on the BBQ and this dough sounds like it would work really well!! Yes and Yes Gloria. I use this pizza dough for everything including the grill and it cooks perfectly. Hope you try it ! ~ florentina! Hi you have a lot of lovely pizza recipes. So its ok to use normal water or cold water instead of the warm water? I usually make my pizza dough the night before and refrigerate until ready to use. Do you think that would affect the quality of this recipe? You can definitely make the dough in advance and refrigerate it. Make sure to cut it into smaller rounds and individually wrap them in plastic wrap with a little olive oil. Place it on the kitchen counter a couple of hours before you want to make your pizza and allow it to rise and proof just sitting there. I’m honestly SO excited to try this!! My husband and I never recovered from our trip to Italy when it comes to pizza. We make our own very often in order to try and get it as close to the “real” thing as possible. This recipe might just change our whole approach. THANK YOU! Hi Quin, please report back on your pizza adventure 🙂 This is one of my most treasured recipes. 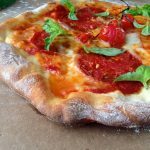 I had been trying and searching for Pizza Dough recipe, here i am, may i know what type of flour the recipe used? The amount water may varies , right ? Do you have the recipe by weight ? Hi Simon, it is just regular all purpose flour. I don’t have it by weight, but honestly you will have to add more or less depending on how much water your flour will take.Just make sure the dough sticks only a little bit to the bottom of your bowl. Best pizza dough ever!!! Easy to make, fast cooked and delicious taste. I used parchment paper… Super easy to manipulate from countertop to oven and back. I don’t have a pizza stone for the oven. What do you reccomend i do? HI Florentina. I am very excited to try you pizza dough recipe but I do not own a kitchen aid. Would my kneading time be the same the old fashion way? Just got a pizza stone, and found your site searching for a great pizza dough recipe. I’m curious though that there is no sweetener noted, like sugar or honey. I have instant yeast, but I’ve never seen a pizza dough recipe without some sort of sugar added for the yeast. Did I miss it somewhere? Thank you! I just wanted to thank you for a wonderful pizza dough recipe!!! It is not gummy or too doughy! Ever since I visited Italy finding true Italian foods has been hard! Also being a vegetarian Italian foods have been a godsend! I have tried to find Italian recipes so I can cook at home myself! Also I have moved to the West coast from NYC and trying to find true Italian food has been rough! This has been the best dough recipe ever! Thank you! You Rock. I’ll be bookmarking your site. How many individual pizzas/dough balls does this recipe make? I have a question, should I be using all purpose flour or bread flour? Also, any tips for the pizza stone? I have the Emile Henry one and for some reason, we can’t seem to get it right. Either the bottom of the pie never crisps due to possibly too much flour, or we don’t use enough and it burns. We tried cornmeal but didn’t enjoy the taste. Any advice (from anyone) would be appreciated. Hi. Has anyone tried making this on a grill? Hi Silvi, yes i have made it on the grill as well. Makes sure to grill both sides before adding any toppings then move away from direct flame and cook until the cheese has melted. Hi there! Does it matter what kind of yeast you use? For my rustic bread I use rapid rise/instant yeast can I use that? This recipe is amazing! 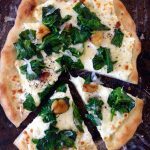 I have been searching for a good pizza dough recipe and I have tried a bunch, but this is our family’s favorite. My husband begs me to make pizzas pretty much weekly. I was wondering, can I make a smaller number of larger pizzas with this dough? What would the cooking time need to be adjusted to? We have guests coming and I wanted to just make a couple of pizzas instead of a bunch of smaller ones. My pizza dough hasn’t risen at all in 90 minutes. I followed your instructions to the letter. I’m using “Fleishmann’s traditional active dry yeast”. Why isn’t it rising? The package of yeast said I’m supposed to put it warm water first. Help? HI Dave, what was the end result ? Did you end up baking the pizza or what happened? I’ve never had an issue with it rising at all, this is the COLD water method so ignore the package, just make sure it is active dry yeast. Remember to keep your yeast in a cool place! I couldn’t figure out why my yeast wasn’t working, and then I realized I had been keeping it in the cupboard above the oven and it got too hot. Also make sure it’s not expired. Hi this recipe looks great I’m going to try it, i will be making by hand donyou have instructions please? Hi Tania, you’ll need to give your arm a little workout and knead the dough for about 20 minutes or so. This was the first time I’ve ever made pizza dough (or anything involving flour and yeast). Had trouble when mixing initially. It wasn’t sticking to the sides of my mixer, but was way too sticky to handle and get off the hook. Eventually got it but had to add more flour than I expected. I fired these with a pizza stone on my kamado grill. Stone was 700 degrees when I put them in. Cooked nicely in about 4 minutes (they were small pizzas). Perfect crispy crust but it puffed up thicker than expected. Wasn’t really a thin crust pizza at that point. Hi Jared, just make sure to stretch out the pies thinner next time. Also you can use a fork to poke the sides of it so it doesn’t puff up too much while baking. Depending on the flour we use sometimes it might take more or less, cooking is never 100% exact formula, just trust your instincts, you’ll do great! Hi there! I am very excited on try this recipe, but I don’t have a mixer or processor. Would you mind giving instructions to make this by hand? Hi Liem, I just added the instructions by hand to the recipe as well. You just need a little elbow grease to knead it a little bit longer, so pretty much the same process just using your hand and your kitchen counter. Enjoy! After many pizza dough recipes I think this is the one! This dough has a nice soft texture and is easy to work with. I divided it into 4’s instead of 6’s. After the 2 hour rise I froze 2 and put 2 in the frig for later in the day. One thing that I have found after trying many recipes is not to rush the dough. I start to shape the dough in the pizza pan but once the dough starts to resist I let it rest. If you keep stretching the dough you will end up with those dreaded holes in your dough. Once the dough starts to resist just leave it alone for 10 minutes or so, drink your wine and come back to it. The dough will have relaxed and is much easier to continue to shape. That’s been my experience anyway. That said I found this recipe one of the easiest pizza doughs to work with. Also think that is why those quick pizza dough recipes are never as good or as easy to work with as these that have at least a couple hour rise time. Thanks for this recipe. Really Good! My pleasure, so glad you loved it! Hi this is my first time with making pizza dough and your recipe was so simple I loved It!!! Just one question, I did use the active dry yeast, I just noticed that after all the mixing the yeast was still in its little pebble form, is that normally? Can this be baked in a wood burning pizza oven. I am looking for a good dough because all the ones I have tried making were a real disappointment. Yes definitely! It is a thin crust style so keep an eye on it and report back! Absolutely the best pizza dough recipe ! If you don’t want to heat the house up in the summer, put it on the grill. Love it both ways !!! Thank you Robin! We will have to agree on that one 😉 Yes and Yes to grilling pizza inside on a cast iron skillet. The thinner you stretch it the quicker it cooks and the crispier it gets! Just wondering, can the dough be made and then left in the fridge for a while before needing the 2 hrs to rise? Like could I make this first thing in the am and then take out early afternoon, to rise and make in the early evening? Yes you can refrigerate it as soon as you mixed the dough. You can also freeze it individually and then take out what you need about 3 hours before cooking. This has become my go to recipe for pizza dough! I’m always getting compliments on it and people always ask for the recipe! Best pizza crust recipe ever, easy to make and comes out so crispy and thin and tasty. Where is the video? Would like to watch. Sorry, we had some tech issues that affected the video player performance, hope to have it back up and running soon. Thanks for understanding! this is a great pizza dough it very easy to mske loved it. Joanne, I haven’t experimented with the bread maker so I wouldn’t want to mislead you. Can you use 00 flour in this recipe? I do have to say, I was skeptical about the dough using cold water went against everything I knew about pizza dough, warm water and yeast. It worked though. Portioning out the dough for the rise worked well for individual pizzas and freezing the doughs. Good dough. Turned out good. Would make again. Will the cold water method still work if I use the rapid rise yeast? Was the pizza pictured here done on a grill? Most oven swill burn the cheese before the crust is crusty at such high temps. This was done in the oven. Don’t worry the cheese won’t burn because this crust is very thin so it cooks super fast. Hi Floentina, Your recipe looks terrific. I don’t have a Kitchen Aid but I do have a food processor. Any tips you’d like to give me before I try your recipe out??? Do you use bread flour or all purpose? Hi Gig, you can always sprinkle in a little more If it is too sticky to handle. Even the same brand of flour can behave differently at times. Once you get a feel for how the dough should feel when handled you’ll be a pro. Sometimes I have to add more flour myself, just add a little bit and then a little bit more. It will never be exactly 100% the same every time. You got thi! 1.5 teaspoons of active dry yeast, NOT cups. I just thought I would stop by and say we LOVE this crust and we have successfully frozen it in a ball, par cooked and either topped or not all with great success. I do flash freeze each pizza before sealing it in a foodsaver bag and have found that oblong seems to fit best in our freezer rather than round. Thank you for a simple crispy crust with a nice chewy texture if it is a bit thicker. Sorry, I meant to say in a ball OR rolled out and par-cooked like 8 or 9 minutes. I would hate to cause confusion. I rode the dough for 3 hours instead by accident. Will my pizza still turn out?? 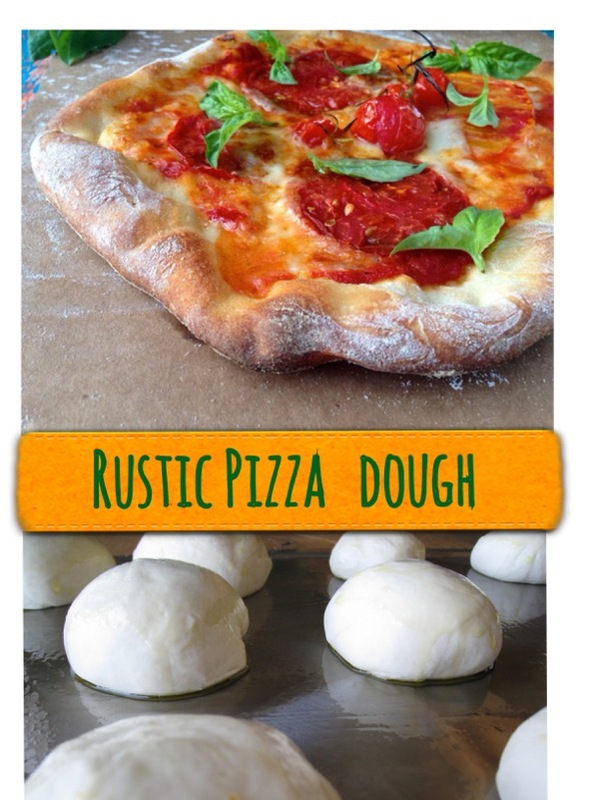 This rustic pizza dough recipe was Perfetto per mi! I played basketball in Italy for six years and was spoiled by the simplistic way that the foods are made! I’m spoiled now and won’t settle! Now, as a chef, I simply want good…nay, great food that’s easily prepared. You’ve done that with this recipe. Thank you for sharing your recipe. It’s both simple and bakes up perfectly. My family loved it! My son started speaking Italian after eating his pie and he doesn’t even speak Italian! Lol. All the best and continued success to you. Hi, your pizza looks amazing! Can’t wait to try it out.. what type of flour did you use? I read that ‘00’ flour is the best flour for pizza and was just wondering what you used for yours. I won’t even bother looking for another pizza dough recipe. This was delicious! I cooked the pizza on a pizza stone and finished it under the broiler as suggested, and it was amazing. I’ve made pizza dough before and it wasn’t even close to this good. I also made breakfast pizza the following morning with leftover dough, and once again, it didn’t disappoint. Thanks for the great recipe! That’s fantastic! So happy it turned out great for you! Enjoy! Hello, the recipe and the photos look really good. I have two questions though – ok if i just bake it in the oven without the stone, its not available anywhere where i Live and also, can i knead it by hand instead of the dough kneader. and if yes approx how much time would be good enough? Thanks in advance. Yes you can bake it on a cast iron plate or skillet if you have that otherwise it won’t be as crispy. You can also knead it by hand, i’d say a good 10-15 minutes would be great! Just organic all purpose flour. I always hate it when someone alters a recipe before trying it. Having said that, I used bread flour (higher gluten content) and I was short on time so I only let the dough raise about 40 minutes or so. I made one half of a recipe and one large pizza, therefore my crust was on the thick side, and needed longer to bake . The crust was soft in texture-really nice with a chewy crust. Next time I would use one half recipe to make 2pizzas instead of one and I think it will hit my crust thickness preference just right. This is a beautiful recipe that I will use for years to come. Thanks! Excellent recipe! Easy quick and extremely versatile. Thank you for sharing. This Pizza was crispy, tasty, and delicious! The whole family loved it! For sure I will make it again! Absolutely delicious base! Five stars hands down! No kidding, the best pizza I’ve ever made in my entire life and as good as the ones I’ve had in Italy. 10 stars from me! I’m seriously the worst at pizza dough because it never comes out good enough for my liking however, this recipe came out PERFECT. I love that you use cold water for the yeast because the yeast is always what I screw up. Thank you for this recipe! !